Predominantly in Miami metropolitan area, New York City metropolitan area, Orlando, FL, Los Angeles, San Antonio, Tampa, FL, and New Jersey. Growing populations in Philadelphia, Greater Boston, Washington, D.C., Chicago, and Greater Houston. Colombian Americans (Spanish: Colombo-Americanos), are Americans who trace their ancestry to Colombia. The word may refer to someone born in the U.S. of Colombian descent or to someone who has emigrated to the U.S. from Colombia. Colombian Immigrants and Colombinos (Colombian American) are the seventh-largest Latino group and the largest South American Latino group in the United States. The first Colombians immigrants who settled in the United States likely arrived in the 1800s. However, the Colombian Immigrants and Colombino (Colombian American) presence in United States would not be known with certainty since the federal census did not specify the country of origin for South Americans until 1960. These immigrants did not maintain any relation with their native countries, just until a few generations after, they identify themselves only as Americans. The first Colombian Immigrants and Colombinos (Colombian Americans) community formed after World War I, through the arrival of several hundred professionals (nurses, accountants, laboratory technicians, pharmacists, and bilingual secretaries) that established themselves in New York City; later on, more people were added to the community when Colombian Immigrant students decided to stay in the US after earning their degrees. Most immigrants settled in Jackson Heights, a middle-class neighborhood in the borough of Queens in New York City, that has good housing, schools and churches. The growth of the Colombino (Colombian American) and Immigrant Colombian population was slow until 1940, when there was an increase in Colombian immigration to New York. Most Colombians who arrived after the mid-1960s wanted to stay in the United States temporarily. Therefore, the number of undocumented Colombian immigrants increased: from 250,000 to 350,000 people in the mid 1970s. Despite a succession of immigration laws, the Colombian population in the United States continued to grow. New York remained the most popular destination. Smaller communities formed in Los Angeles, Houston, Philadelphia, and Washington, D.C. and in the 1970s, North Side, Chicago. Since the 1980s, many Colombian Immigrants and Colombinos (Colombian Americans) have settled in Miami (especially in its suburbs, such as Doral, Kendall, and Hialeah, and the Weston suburb of Fort Lauderdale). Initially they settled in Little Havana, the largest Cuban neighborhood, many of them engaged in the business of trade between Miami and Latin America. The area also attracted wealthy Colombians, who settled there to get medical care, send their children to school, and escape from social, economic, and political turmoil in Colombia. By 1987, Colombian Immigrants and Colombinos (Colombian Americans) were one of the fastest growing Hispanic groups in Miami. By the early 1990s, many Colombian Immigrants and Colombinos (Colombian Americans) left the metropolitan centers for the suburbs due to crime and the high cost of urban living. This trend was probably started for the first time in the coastal towns of Connecticut and New York. Colombian Immigrant and Colombino (Colombian American) communities grew significantly in places such as Stamford, Connecticut, Bergenline and Englewood, New Jersey, Jacksonville, Florida (which attracted a growing number of people from Miami), and Skokie, Evanston, Arlington Heights and Park Ridge, Illinois. Despite the migration to other areas, the largest communities remained in New York City, Miami, and their environs. In 1990 and 1991, 43,891 Colombians were admitted to the United States, more than from any other South American country. They were for the first time the most populous group of undocumented immigrants in the US from South America. Between 1992 and 1997, the intensity of the conflict in Colombia increased, so nearly 75,000 Colombians immigrated to the United States in this period, many of them going to California. In Miville's "Colombians in the United States: History, Values, and Challenges," the nature of Colombian migration is described. He writes,"Colombian migration patterns have been distinguished by scholars as three distinct waves involving diverse demographic groups, reasons for migrating, and contextual factors with a mixture of push and pull factors from both the originating and host countries (Madrigal, 2013; Migration Policy Institute, 2015). Immigration to the United States was essentially minor from about 1820 to 1950 when fewer than 7000 Colombians immigrated to the United States. Indeed, the Colombian presence in United States was not recognized officially until 1960, when the U.S. Census began to specify the country of origin for South Americans (Migration Policy Institute, 2015)." Economic problems and violence have led to an emigration of Colombians to the United States, particularly South Florida (especially in the suburbs of Miami, Florida such as Doral, Kendall, and Hialeah, and the Weston suburb of Fort Lauderdale), Central Florida, New Jersey (North Jersey), Queens County in New York City, Philadelphia, the Washington DC metro area, eastern Long Island, and an expanding community in California, Texas and Georgia, mainly in the Los Angeles, Houston and Atlanta areas. After of World War I, many Colombians immigrated to United States in order to complete their education there, studying in the universities of the country. Most of them settled in New York. After the civil war in 1948 and increased poverty in Colombia many Colombians also emigrated to United States during the 1950s. In the 1960s, the economic crisis prompted the emigration of many Colombians to the United States, obtaining U.S. citizenship Between 1960 and 1977. Since the 1980s, many Colombian Immigrants and Colombinos (Colombian Americans) fled their urban cities to migrate to suburban areas in states like New Jersey and Connecticut, as their socioeconomic status improved. The conflict escalation between guerrillas, paramilitaries, and narcos between 1992 and 1997 also boosted the Colombian emigration during this period. As was discussed earlier, about 75,000 Colombians immigrated at that time the United States, concentrating mostly in the state of California. As of the 2000 Census, 228,400 Colombian Immigrants and Colombinos (Colombian Americans) were living in the New York metro area and 169,271 Colombian Immigrants and Colombino (Colombian-Americans) were living in the Miami metropolitan area. The largest Colombian Immigrant and Colombino ( Colombian American) community lives in the South Florida area (Doral, Kendall, Weston, and Hialeah) with a population of 138,768, and Jackson Heights in Queens County, New York city. In New York City, a large Colombino (Colombian American) and Colombian Immigrant community thrives and continues to expand in size since the wave of immigration began in the 1970s. Jackson Heights in Queens County was heavily Colombian and Colombino (Colombian American) during the 1980s, but other immigrant groups have settled in the area, notably Ecuadoreans and Mexicans. Many of the displaced Colombians have moved to adjacent areas such as Elmhurst, East Elmhurst, Corona, while wealthier Colombian Immigrants have gone further afield to College Point and Flushing. Queens County still has the largest concentration of Colombian Immigrants and Colombinos ( Colombian Americans) in the United States of any county (roughly 75,000). Ethnically, Colombinos (Colombian Americans) and Colombian Immigrants are a diverse population including Colombians and Colombinos (Colombian Americans) of European ancestry (mainly Spanish) ancestry, Afro-Colombians, and Colombians and Colombinos of Indigenous ancestry. However, the majority of Colombian Immigrants and Colombinos (Colombian American) are Castizo and Mestizo (Amerindian/European). In addition, many Colombians and Colombinos of Middle Eastern descent, notably Lebanese Colombians, also compose Colombian Immigrants and Colombinos (Colombian Americans). Until 1960, most Colombians emigrating to the United States were white or mestizos. However, between this year and 1977, a period in which more than 116,000 Colombians emigrated to the United States, are becoming more ethnically diverse, representing the ethnic diversity of the population of Colombia. So today, although most Colombian Immigrants and Colombinos (Colombian Americans) are white and mestizos, there are also numerous Afro Colombians in the Colombian Immigrants and Colombino (Colombian American) population. Colombian Immigrants and Colombinos (Colombian Americans) . Colombians and Colombinos, (Colombian American) based on various studies and a survey, about 90% of the population adheres to Christianity, the majority of which (70.9%) are Roman Catholic, while a significant minority (16.7%) adhere to Protestantism (primarily Evangelicalism). Some 4.7% of the population is atheist or agnostic, while 3.5% claim to believe in God but do not follow a specific religion. In addition to the above statistics, 35.9% of Colombinos (Colombian American) and Colombian Immigrants report that they did not practice their faith actively. A majority (64%) of Colombian Immigrants and Colombinos (Colombian American ) ages 5 and older speak English proficiently. The other 36% who are Colombian Native report speaking English less than very well, compared with 32% of all Hispanics. In addition, 83% of Colombian Immigrants and Colombinos ( Colombian American ) ages 5 and older speak Spanish at home. Musical styles that are enjoyed by Colombian Immigrants and Colombinos (Colombian Americans) include Vallenato and Cumbia. The main pastime of Colombinos ( Colombian Americans) and Colombian Immigrants in the United States is soccer, and most Colombinos (Colombian Americans) raised in the United States continue to follow soccer. Another popular pastime, especially among the older generation, is parqués, a Colombian board game which is very similar to Parcheesi. A traditional Bandeja paisa meal. A staple dish assembled with several foods making necessary to use a platter. It is made of beans, rice, fried eggs, chorizo, pork rind and other ingredients depending on the location. Colombian food is varied due to the several distinct regions of Colombia. Popular dishes include bandeja paisa, sancocho (chicken or fish soup with plantain), empanadas (meat-filled turnovers), pandebono and pan de queso (types of cheese-bread), and arepas (corncake similar to a tortilla). Colombian food is popular and well known in South Florida and in Queens County. Some of the most common ingredients are: cereals such as rice and maize; tubers such as potato and cassava; assorted legumes; meats, including beef, chicken, pork and goat; fish; and seafood. Among the most representative appetizers and soups are patacones (fried green plantains), sancocho de gallina (chicken soup with root vegetables) and ajiaco (potato and corn soup). Representative snacks and breads are pandebono, arepas (corn cakes), aborrajados (fried sweet plantains with cheese), torta de choclo, empanadas and almojábanas. 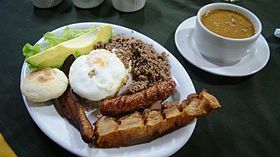 Representative main courses are bandeja paisa, lechona tolimense, mamona, tamales and fish dishes (such as arroz de lisa), especially in coastal regions where kibbeh, suero, costeño cheese and carimañolas are also eaten. Representative side dishes are papas chorreadas (potatoes with cheese), remolachas rellenas con huevo duro (beets stuffed with hard-boiled egg) and arroz con coco (coconut rice). Colombian coffee is the world's most popular coffee and is renowned for its high quality and distinct flavor. Though much of the world's quality coffee beans come from Colombia, there are many Colombians and Colombinos that drink instant coffee rather than brewed. It is popularly consumed as a "tinto", meaning black with sugar or panela on the side, or as café con leche, which is a preparation of half coffee and half heated milk. Some other representative beverages are champús, cholado, lulada, avena colombiana, sugarcane juice, aguapanela, and hot chocolate. Aguardiente is popular alcoholic drink derived from sugarcane and flavored with anise. It is widely consumed at Colombian parties, and ranges in potency from 20% to 40%. Aguardiente is a variation of the Spanish alcoholic drink. Colombia cuisine also features a variety of tropical fruits such as cape gooseberry, feijoa, arazá, dragon fruit, mangostino, granadilla, papaya, guava, mora (blackberry), lulo, soursop and passionfruit. Colombia is one of the world's largest consumers of fruit juices. These juices have made their way to supermarkets all across the United States. The annual personal income for Colombian Immigrants and Colombinos (Colombian American) is $25,000, a figure higher than many other Hispanic groups at $21,900, but lower than that of the US population at $30,000. The rate of Colombian and Colombino (Colombian American) homeownership is (45%) but lower than the 64% rate for the U.S. population as a whole. This takes into account the younger average Colombian American (Colombino) population. The Colombians and Colombino who live in poverty, 16%, is the same as the rate for the general U.S. population and lower than the rate for Hispanics overall at 25%. 33% of Colombians and Colombinos ages 25 and older—compared with 14% of all U.S. Hispanics and 30% among the entire U.S. population—have obtained at least a bachelor's degree. 42% of U.S.-born Colombian-Americans (Colombinos) are more likely to have earned a bachelor's degree or higher, as compared to 30% of foreign born Colombians. For a more comprehensive list, see List of Colombian Americans. Scott Gomez - played for 16 seasons in the NHL, from 1999 to 2016. Kiko Alonso - Starting Right Outside Linebacker for the Miami Dolphins. Jorge Acosta - Played in various ASL teams, including a brief stint with the United States national team in the early 1990s. Juan Agudelo - Currently plays for New England Revolution in Major League Soccer and for the United States national team. Alejandro Bedoya - Currently plays for Philadelphia Union in Major League Soccer and for the United States national team. Wilman Conde, Jr. - Played in the MLS for the Chicago Fire in MLS. ^ Percentage of the state population that identifies itself as Colombian relative to the state/territory" population as a whole. ^ a b "US Census Bureau 2016 American Community Survey B03001 1-Year Estimates HISPANIC OR LATINO ORIGIN BY SPECIFIC ORIGIN". Factfinder.census.gov. Retrieved September 14, 2017. ^ a b c d e f g h i "Colombian Americans - History, Immigration, Acculturation and Assimilation, Holidays, Dances and songs, Health issues". Everyculture.com. Retrieved 4 October 2017. ^ "Colombian Immigration". Umich.edu. Retrieved 4 October 2017. ^ "Ancestry Map of Colombian Communities". Epodunk.com. Retrieved 2008-01-25. ^ "American FactFinder - QT-P10: Hispanic or Latino by Type: 2010". Factfinder2.census.gov. Retrieved 4 October 2017. ^ "Hispanic or Latino by Type: 2010 Census Summary File 1". factfinder.census.gov. 2010. Retrieved June 5, 2015. ^ Bureau, U.S. Census. "American FactFinder - Results". factfinder.census.gov. Retrieved 4 October 2017. ^ a b c d e f g h i j k l m n o p q r s t u v Bureau, U.S. Census. "American FactFinder - Results". factfinder.census.gov. Retrieved 4 October 2017. ^ "Top 101 cities with the most residents born in Colombia (population 500+)". city-data.com. Retrieved 2008-07-16. ^ Beltrán Cely; William Mauricio (2013). "Del monopolio católico a la explosión pentecostal'" (PDF) (in Spanish). Universidad Nacional de Colombia, Facultad de Ciencias Humanas, Centro de Estudios Sociales (CES), Maestría en Sociología. ISBN 978-958-761-465-7. ^ Beltrán Cely; William Mauricio. "Descripción cuantitativa de la pluralización religiosa en Colombia" (PDF). Universitas humanística 73 (2012): 201–238. – bdigital.unal.edu.co. ^ a b c d "Paseo de olla. Recetas de las cocinas regionales de Colombia - Biblioteca básica de cocinas tradicionales de Colombia" (PDF). Mincultura.gov.co (in Spanish). Retrieved 6 July 2016. ^ "Food presentation" (PDF). Mincultura.gov.co (in Spanish). Retrieved 22 January 2017. ^ a b c d "Gran libro de la cocina colombiana - Biblioteca básica de cocinas tradicionales de Colombia" (PDF). Mincultura.gov.co (in Spanish). Retrieved 6 July 2016. ^ a b c d e "Hispanics of Colombian Origin in the United States, 2013". Pewhispanic.org. 15 September 2015. Retrieved 4 October 2017. Wikimedia Commons has media related to Colombian diaspora in the United States. This page was last edited on 19 April 2019, at 17:23 (UTC).